The arrival in of ‘The incredible 2’ has caused us to think about the long history of animated cinema. Many jewels have been released over the years and during recent times it is increasingly common to find one or more titles in our nearest cinema. A great reminder of the great talent of Kaufman in a film that focuses on removing certain emotions that we have inside that few films dare to play. He also does this without ever giving up the bitterness so that his message connects more strongly in a spectator who, yes, will have to enter into his visual as well as plot bet to be able to “enjoy” fully with it. An impeccable adaptation of the exceptional comic by Paco Roca that delicately but with great conviction addresses Alzheimer’s. With the exception of his epilogue, everything works wonderfully in this story set in an asylum with a great gallery of characters who first win your heart with the charm and laughter that you provide and then reach another level when the dramatic happens to foreground. I have no doubt that many would not include it among the 200 best animated films, but here it’s time to leave my personal stamp with my favorite classic Disney, a great variant of the Sherlock Holmes universe with a top-notch villain – it’s a shame that it’s so difficult to find Ratigan merchandising, a couple of unforgettable songs and a mix of adventure, humor and suspense as effective. A delight for the senses with which Pixar returned to the first line after a series of films that did not finish living up to what one expects from the studio. A celebration of Mexican culture that explores everything related to the day of death to offer us a first-class visual spectacle but also an exciting story both when it focuses on adventure and when it tries to reach our hearts. The first film of Aardman is still the best one that has come out of a studio based on charming and charming proposals, but which usually fails the last push to sneak in among the biggest ones. Here the freshness of the proposal, which combines very well the tribute to ‘The great escape’ with a peculiar sense of humor, impeccable dialogue and a final section vibrant, prevents that from happening. The best Dreamworks movie to date and that has nothing to envy Disney magic. A tale with a lot of charm that is based on the peculiar relationship that is established between the protagonist and the dragon that unexpectedly crosses his path. A splendid adventure with majestic flight scenes. I have no problem to put a tape that would surely place among my 10 animated films of all time. By the way, its sequel also borders on a very good level, but it does not give you to enter this list. In my opinion -I’m not a friend of clarifying this every two times, but here I thought it convenient to do it-, the best Pixar movie. A film that always hits full, both when you choose comedy-there are many hilarious moments-and when the inevitable dramatic turn comes associated with the changes that Riley is going through and how that affects his emotions. All this seasoned with the creation of a world with echoes to the childhood of all of us, which makes everything much more effective. My favorite animated movie, maybe it is not the best, but there is absolutely nothing in it that does not work. If they even had luck with the deleted scenes, very well discarded. Unfortunately, it was a commercial failure at the time, but it was not long before he achieved prestige at the height of this film that lavishes talent, emotion and charm. Bravo. A huge movie that has left many moments recorded in the minds of moviegoers beginning with that portentous prologue to the rhythm of an unforgettable song, like many others throughout its length. Impressive visually, hilarious when it is proposed and with fair doses of darkness – how underrated is Scar’s song – so that we take the threat more seriously than usual. Everything just fits. A tender and endearing film with an exquisite work of animation that bases its charm both on its two delicious and complementary characters as well as on a simple family-friendly story. One of those sweet tapes that not only do not end up messing, because they manage to connect with the viewer in a way that seems easy when it is very complicated to do so. Laika’s masterpiece until now, a film that takes full advantage of its tight budget -60 million dollars- to offer a unique visual spectacle that takes full advantage of stop-motion animation. In addition, it proposes a mythology that keeps you hooked at all times, also betting on an exquisite simplicity that allows you to follow everything that happens with great ease. Pure magic, an impossible love story developed in a special way in which the songs are perfectly integrated and also shine individually. For example, with the first, an unbeatable presentation for one of the best starts in the history of cinema. Until the Academy of Hollywood surrendered to his feet turning it into the first animated title aspiring to the Oscar of best film. My first contact with the Ghibli cinema came with this excellent film by Hayao Miyazaki as part of a children’s cycle in the town where I grew up. Soon I realized that adults were really the target audience of a work that is not cut when using the gore, but it does so with reason, using it only to illustrate its beautiful story, backed by an impeccable work of animation. A beautiful and painful work that places us in Japan during the end of World War II. Two brothers have to do the unspeakable to get ahead by not being able to count on the help of anyone else and we soon empathize with both his determination and her charm, but they are hard times and that is something that the movie does not happen at all. for high. You are warned. One of the peaks of superhero film that also came at the right time to not be affected by the abuse of Hollywood of this kind of stories, something that did slightly damage to his despite all the great sequel. A great exploration of this type of characters through a peculiar family that also has a great villain and lots of fun. Selick took many years to demonstrate that he could do an essential work of animated cinema without the “protection” of Tim Burton, but when he did it hit the bull’s eye with a film that approaches the darkness in a seductive way and plunges us into a universe tenebrous without affecting too much in it except when the scene requires it. Then it also shines, but in general terms everything works wonders, including the combination of stop-motion with 3D, being one of the few films that really took advantage of this latest technology during the years when too many films wanted to take advantage of the plus in the tickets that supposed to use it. The charisma and charm of Mike and Sulley and guarantee you a minimum of quality as could be seen in the prequel, but here his overwhelming contribution had many more allies, highlighting Boo above all, so adorable that we all wanted to take it home. In addition, a splendid universe is created and eye to the extraordinary final section with the roller coaster of doors, an excellent evolution of the airport scene of ‘Toy Story 2’. A dream come true for me, lover of the characters of Ibanez during my childhood and who still longed to see the film that really captured everything that won me at the time. Here Fesser got it from his unbeatable prologue, and he also did it with an adventure of his own that knew how to respect his universe but to play with him in a tricky way. The enormous popularity that got in certain circles ended up causing the rejection of some, but let’s be fair and recognize that it is a real wonder in every way, from its amazing designs to its precise and delicious script, passing through a gallery of unforgettable characters, Not to mention his great songs and his peculiar sense of humor. An adorable re-reading of the little mermaid that perhaps does not take as much risk as in other works of Ghibli, but in return everything works so well and has so much charm that one can only surrender to what happens on screen. In addition, waste that unique imagination of its responsible in a more accessible than usual but without renouncing its unique style. It is easy to stay with the much commented scene of Anton Ego, as much for what it represents as for its brilliant execution, but it is that before we had been offered an authentic delight from a premise that can generate many rejections – a rat making me food?-. That is saved through a measured rhythm to achieve the effect caused in everything, an impeccable inclusion of the most comic moments within the evolution of history and an absolute control of its most emotional side. The series had not yet reached maturity when it was decided to make a film and it is a pity that it seems that there will never be another, but Parker and Stone took full advantage of the most irreverent side of the series in this amazing musical – I still remember to a mother leaving the cinema with her son who was just beginning – with an irresistible hook. The best animated film trilogy that will soon cease to be with a fourth installment that generates as much curiosity as doubts about the possibility of maintaining the level. The first was the letter of introduction of everything that we fell in love with Pixar, the second brought back what could be a disastrous sequel in a brilliant way and the third was the icing and the one that got us the most inside with its final stretch. After a series of nice short films, he keeps a somewhat predictable story, but its creators already managed their characters so well that everything is extremely fun. A tape especially recommended for the youngest of the house but with a number of incentives unusual for the rest in this type of productions, especially everything related to the tributes to horror movies. 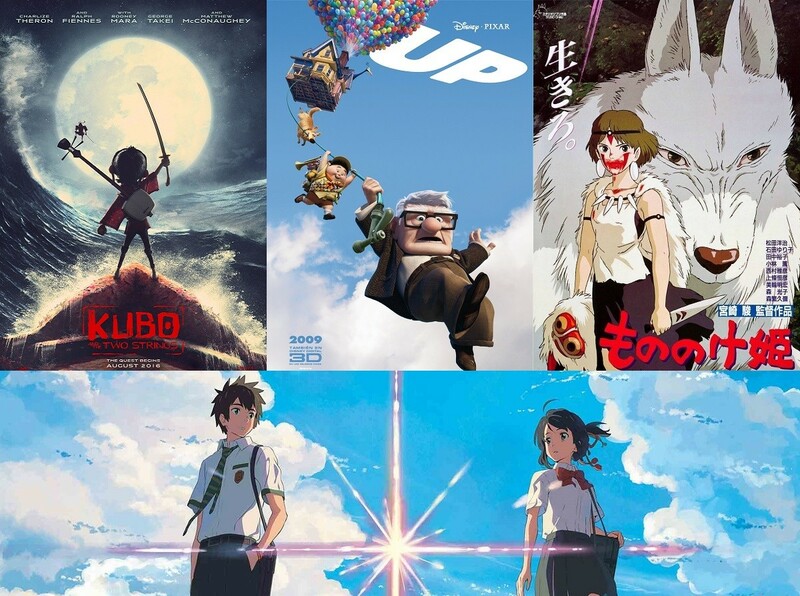 The highest grossing anime in history, honor that until then belonged to ‘Spirited Away’ – no, I have not forgotten to include it in the list, simply in my opinion it is below the included titles -, it is a romance that It starts following a pattern more or less common in this type of proposals, but then it gives a brutal turn to its striking starting point, catching the viewer on the road and offering an exciting show with which many connected with great ease. An unexpected combination of high level humor – many remember only the lazy part, but there is more than that – with a detective plot very well spun and developed with a touch never seen in an animated film. Add to that two characters as well drawn as Judy and Nick and what you have left is the best Disney movie since the 90s. Now it’s your turn, do you agree with this selection of the 29 best animated films in history? Which are your favorites?